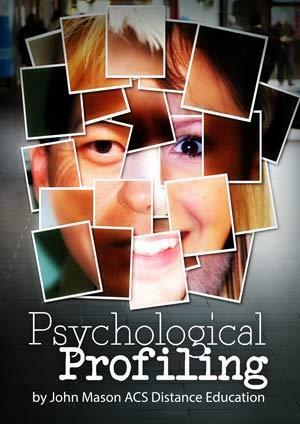 The Psychological Profiling ebook is an interesting guide to understanding personality traits and characteristics of people. A profile of an individual at its most basic is an outline of what a person is really like in terms of their personality traits and characteristics. The most widely known form of profiling is that which is used to assess criminal behaviour. This is largely due to the popularity of TV shows and books which include criminal profiling. - Assessing a person’s suitability for a specific role or profession. - Determining a specific characteristic in a person, such as intelligence or neuroses. - Determining a person’s mental health state. We often also see tests online and in magazines that are termed "psychological tests", purporting to tell you the type of person you are by answering a few questions. Whilst these may be based upon some known pattern of traits, determining an individual’s profile is much more involved than this, and such tests only provide an indication at best. In light of its media and television popularity, psychological profiling has become well-known and accepted over recent years. Profiling is essentially building up a picture of an individual’s characteristics such as likely behaviours, attitudes, personal traits, unique skills or capabilities, and so forth in relation to norms of the general population. It is an assessment carried out by a skilled psychologist, using techniques and tools from psychology to learn general and specific facts about a person. In other words, a profile is a comparison of one person’s traits and behaviours to those of everyone else. It is a picture of how similar or different someone is, how well or poorly they perform, on a range of characteristics in relation to the average scores and performances of the general population. When and why do we carry out profiling? CHAPTER 6 WHAT COMES NEXT?